So it was decided. 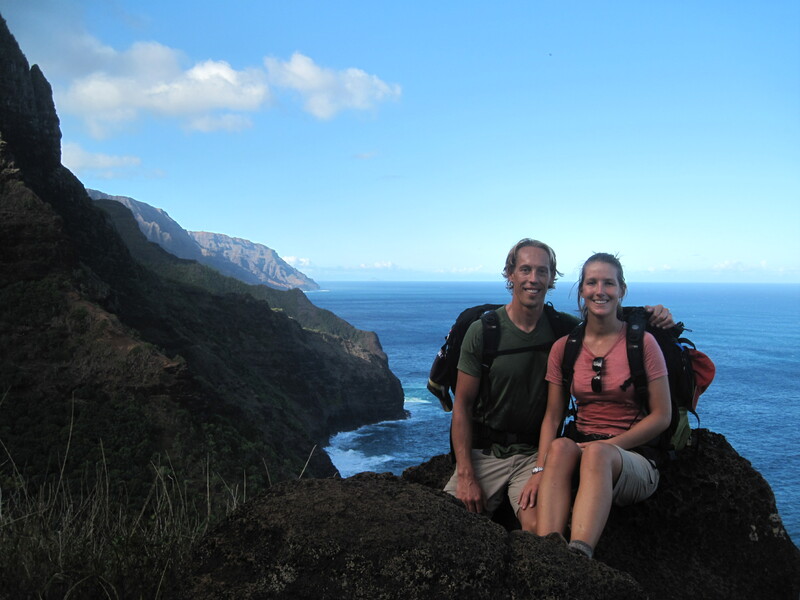 Jill and I were spending 4 days hiking one of the most beautiful and rugged coastlines in Hawaii. 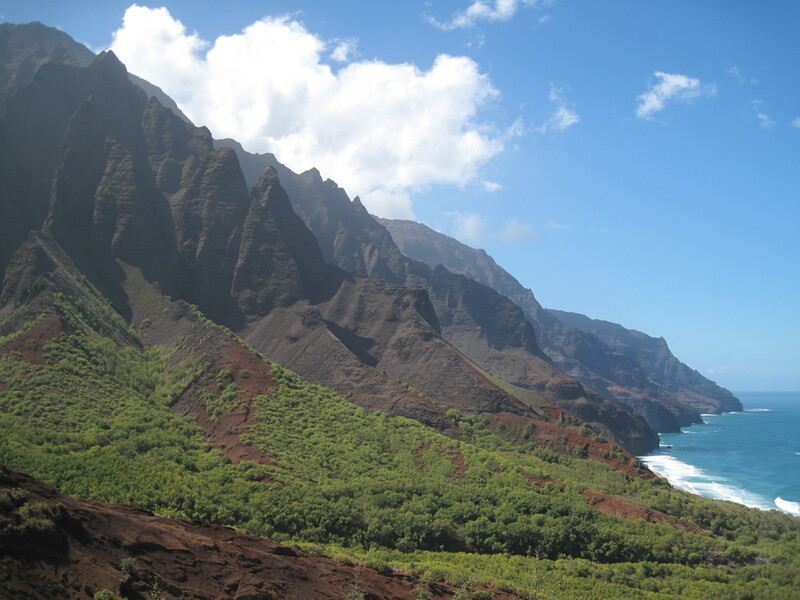 The Na Pali coast. 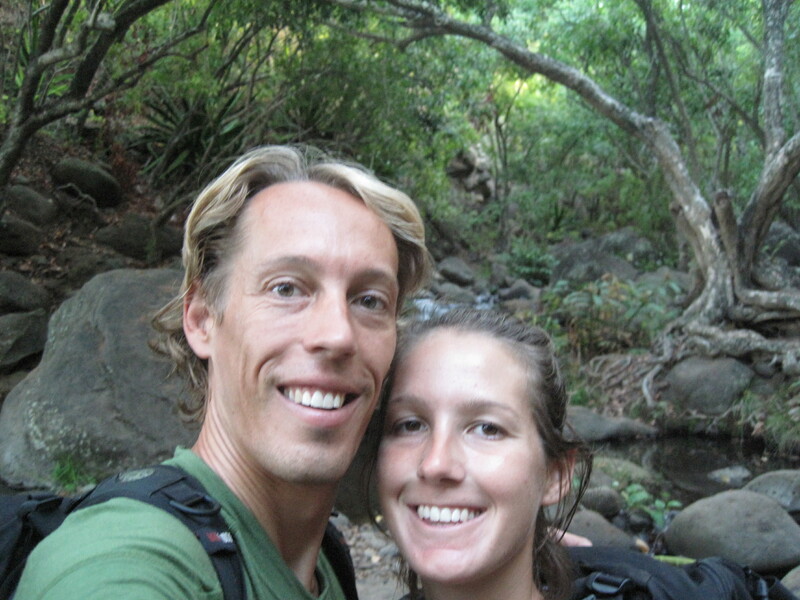 We kept hearing how beautiful and unique this 35km trek was, and even though we didn’t really have the right gear we decided to just do it. Without lightweight cooking gear we decided to live off avocados (which we get free from all the huge trees here) ryvitas, muesli bars, fruit and cereal. And we would sleep in the first tent we bought at a garage sale for $5 who’s fly didn’t fit and had a broken pole. All this stuff wouldn’t fit in our day packs so we made do with our big traveling backpacks. At least our feet were well prepared with our hiking boots. We started climbing up through a thick green canopy and as the road below us disappeared from view I instantly felt more at ease. That was the last major sign of modern man we would see in the next few days. 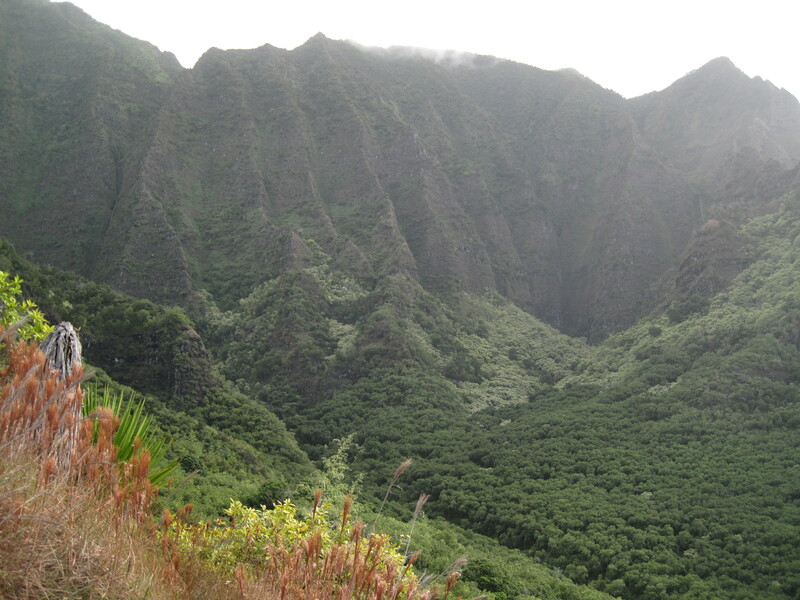 Thoughts of dinosaurs entered my mind as this is the place Jurassic Park was filmed, but I put that out if my mind after picturing a terradactyl swoop down and pluck me off the cliff. As we excitedly made our way up to the first headland we got our first glimpse of our journey ahead. And as all this soaked in, the uneasiness faded away. 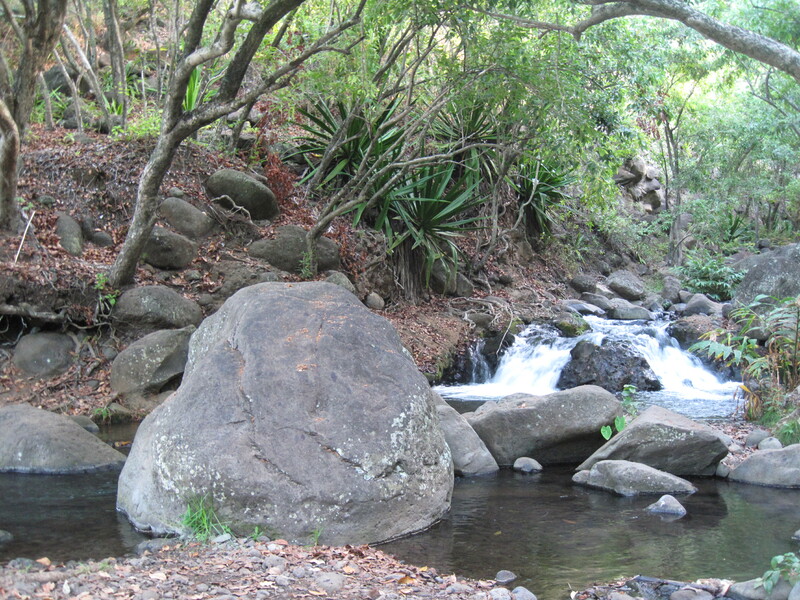 We stopped for lunch where a bubbling creek emptied itself onto a beautiful white sand and round stone beach. 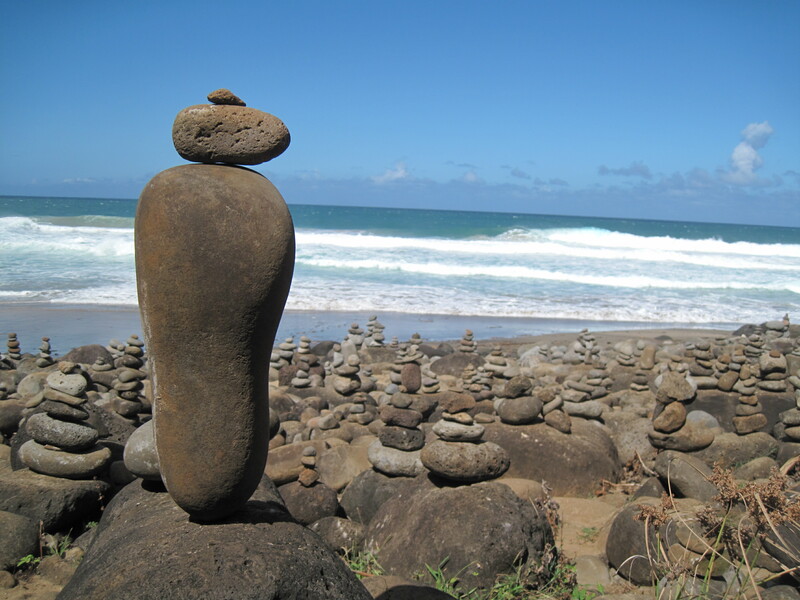 It seemed like some strange place of ritual with all the little stone towers covering the beach. 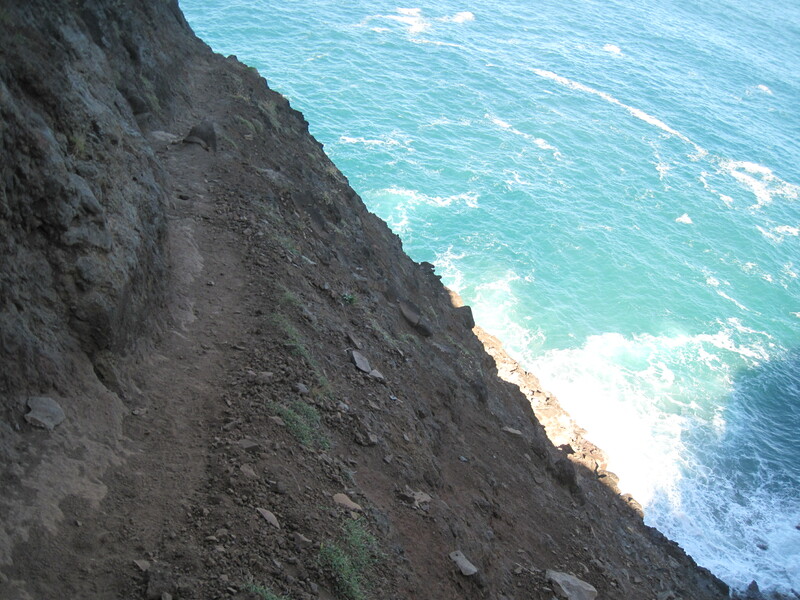 As we headed up from the beach we were now well aware of how this trail went. 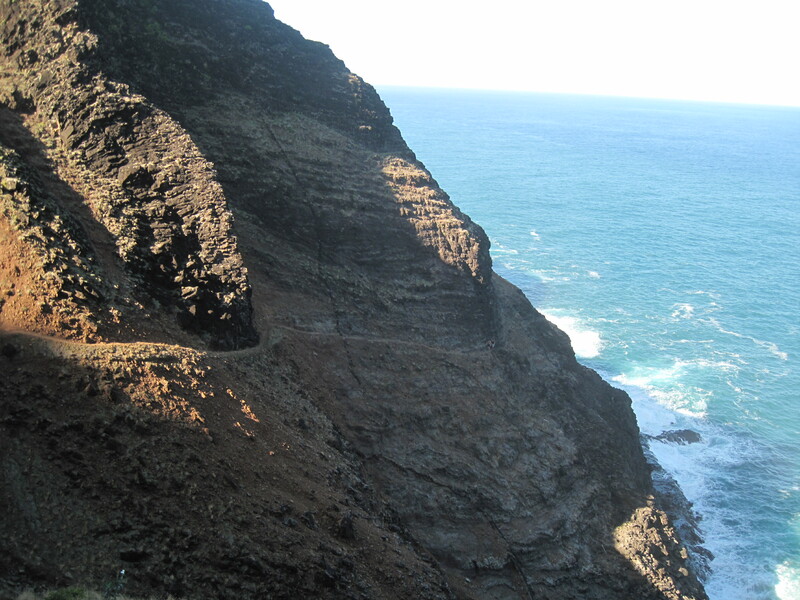 A steep trek up to the headland, hike around it with awesome views of the ocean and the coastline. 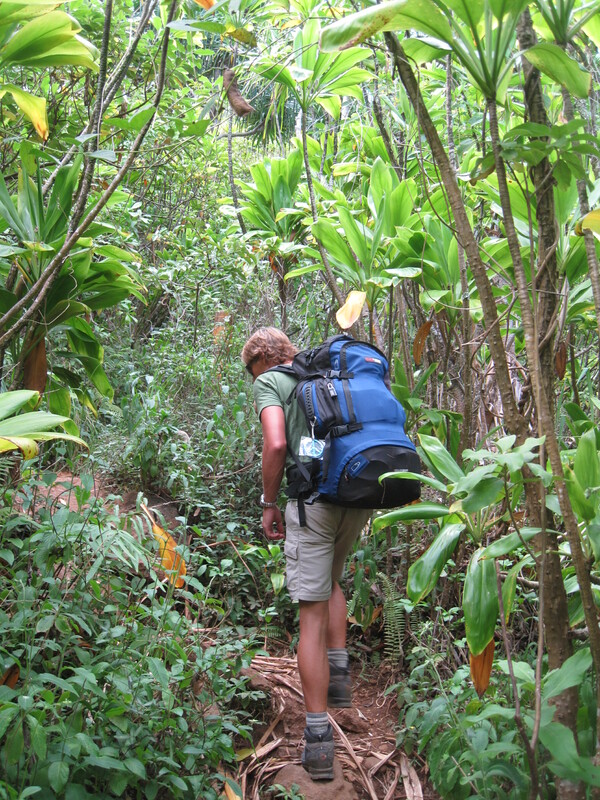 Then go all the way back down and inland into the next valley under a tropical canopy, cross a little stream then start heading back up again. The trail is 17.5km one way, which you have to back track to get back out. It doesn’t sound like much, but the trail is very rarely on horizontal ground. It’s always up or down. Our legs had a hard time coping at the start, but after a while they just keep moving under you without any complaints. 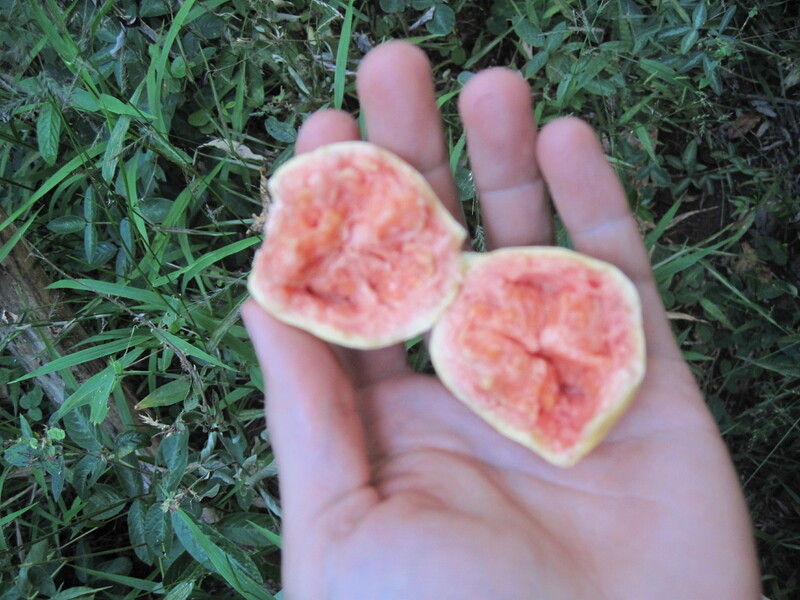 We are stoked to discover that guava trees are spread along the trail, bearing ripe juicy fruit that we snack on throughout the days. There are some tough sections that Jill has a little trouble with, so I stay close by and occasionally give her a helping hand. 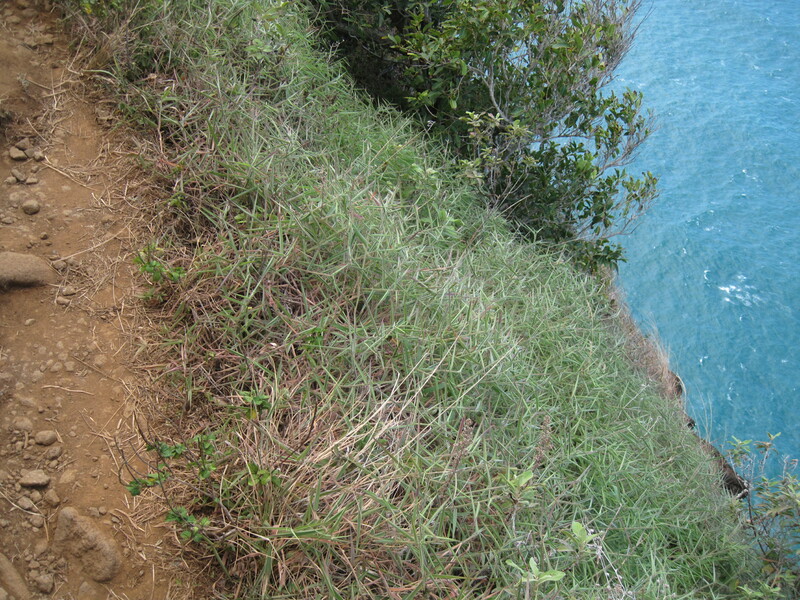 Towards the end of our first day, as we make our way around another headland the path becomes quite narrow and sloped towards a steep drop off down to ocean far below. It crosses my mind that if I slipp down at this point, its all over. But as a scaffolder this doesn’t phase me at all and I make my way across no different to any other part of the trail. I tell Jill to be careful but she knows it and edges her way slowly and carefully, low to the ground. ‘I don’t like this’ she says. There’s a few more sketchy sections and I feel Jill getting more and more tense. 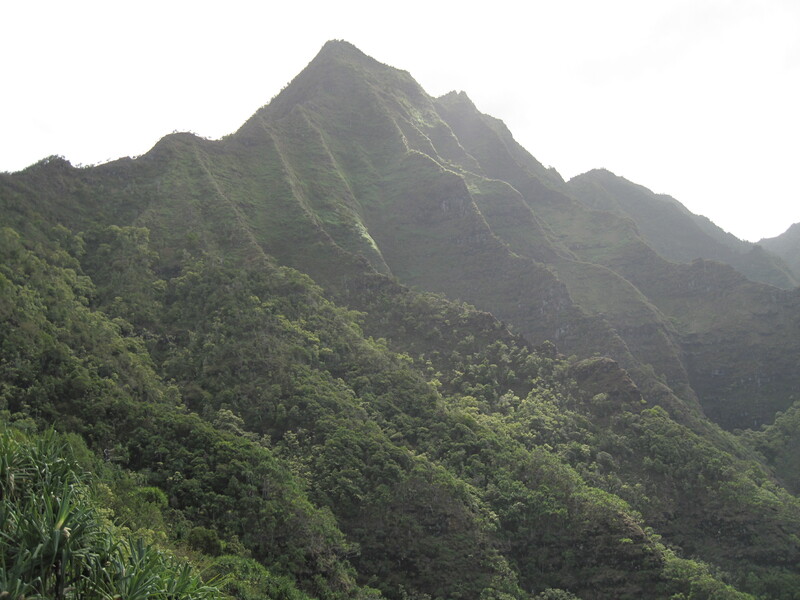 But before long we arrive at Hanakoa, the valley we’ll be camping in. 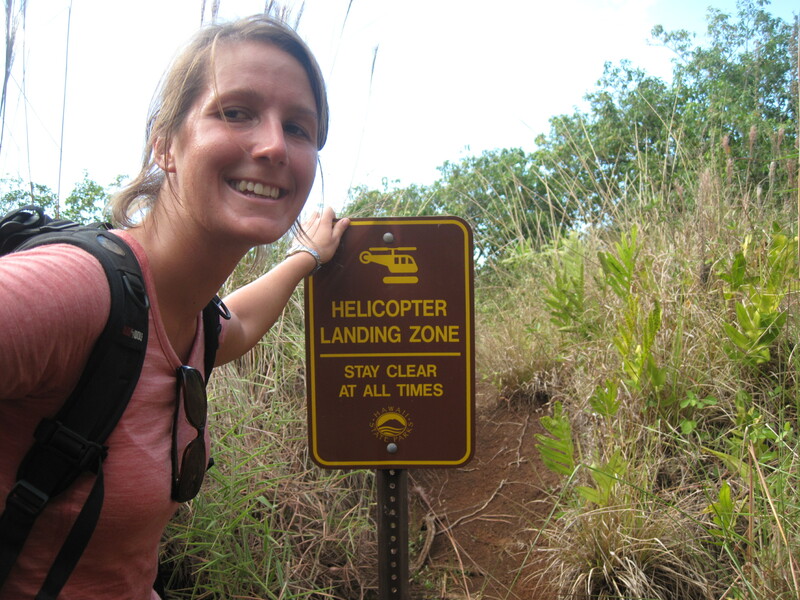 As we pass the tiny helipad patch of grass, Jill states how she might need to be choppered out so she doesn’t have to go back past those steep drops. We set up camp and we’re knackered. Before we go to sleep that night Jill let’s me know that she doesn’t think she can go any further. We know there is one particularly scary section on the second half of the trail. I tell her it’s fine if we don’t finish it but we can talk about it in the morning. The next day Jill is refreshed and willing to have a go. We will continue on and if she can’t do it then we can turn around after we’ve attempted it. I can see Jill is much better and more confident on her feet than at the start and give her the nick name Mountain Goat. The fresh morning breeze feels good and we enjoy the sights and sounds of un-touched nature. But as we come to the part Jill is worried about I can feel her heart sink. Some returning hikers who just came around it give us some encouraging words and we make our way through. With a helping hand and a slow pace Jill follows me around, one step at a time and before we know it it’s over. I tell her how proud I am of my little mountain goat and can see the relief on her face. 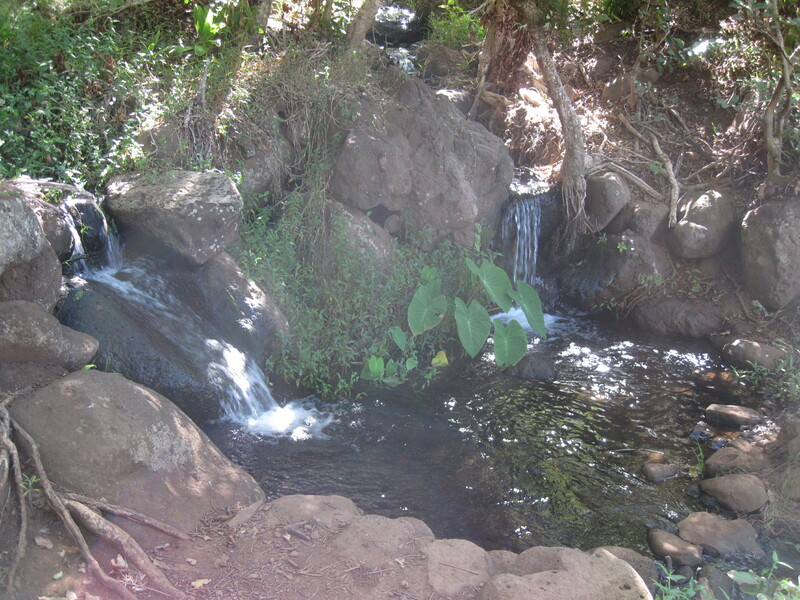 We rest and fill our water bottles at a magical little stream. The rest of the day goes relatively easily. As we make our way around the last headland we are greeted with a magnificent view. I’m not surprised that people come here and decide not to leave. No cars, no buildings, no crowds. It seems fitting that I’m currently reading ‘The Beach.’ There’s about a dozen people who live here permanently. They grow what they can and get what else they need delivered by boat. We spend half an hour chilling by this little stream. The rushing of the water puts us in a meditative trance. It takes me back to the meditation exercises when living in the ashram in Rishikesh, India. The next day we start making our way back. 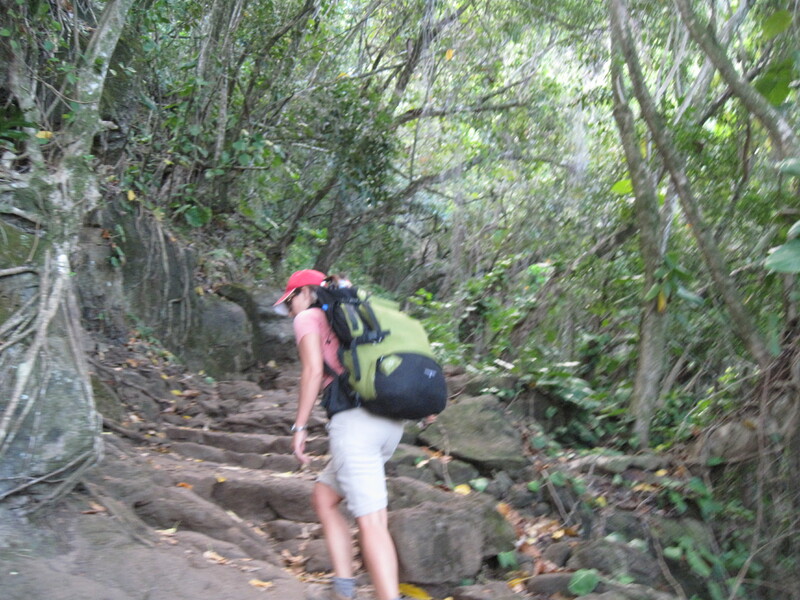 Our bodies feel good and we find that we’re getting uphill much easier than before. I feel at peace and lighter, like my soul has been recharged. 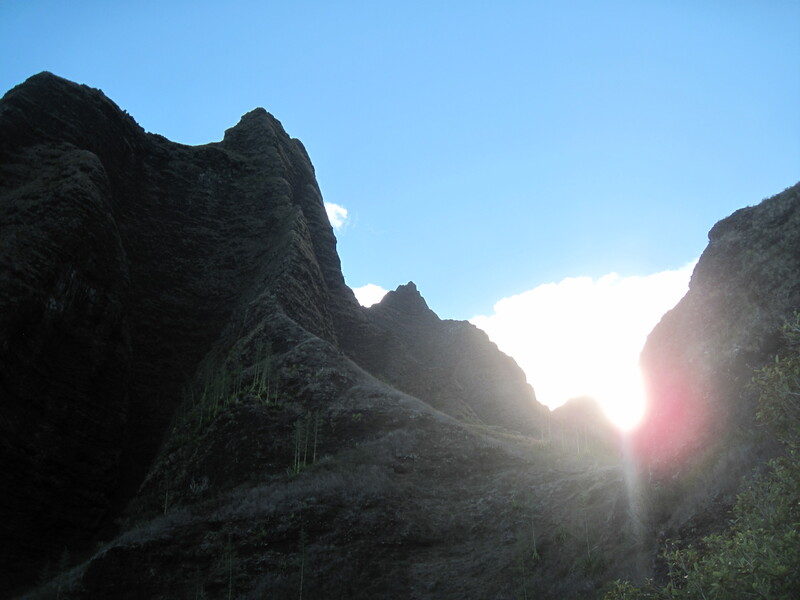 The sun greets us over the mountain to share a beautiful day. When we come to the sketchy section again Jill is a little apprehensive but gets around it easily. We could have continued all the way to the beginning but we were enjoying our time so much that we stayed the night where we camped the first night. We head off early in the morning. I realise as I walk how this hiking is such a good meditation. Concentrating on where you put your feet in the trickier sections and enjoying the sights, sounds and smells the rest of the time, you really are in the moment. 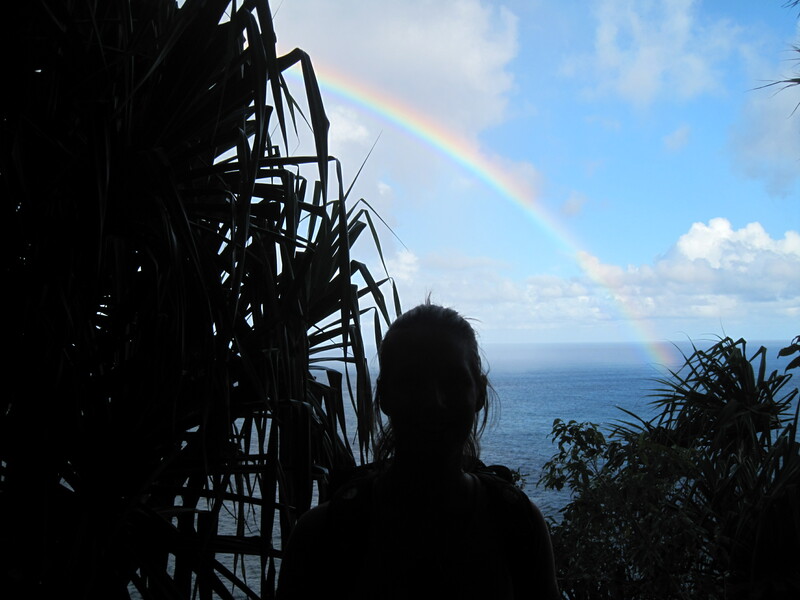 As we come to the end of our hike, our bodies are a little sore and tired but we feel fully alive inside. And we resolve to meditate like this more often. 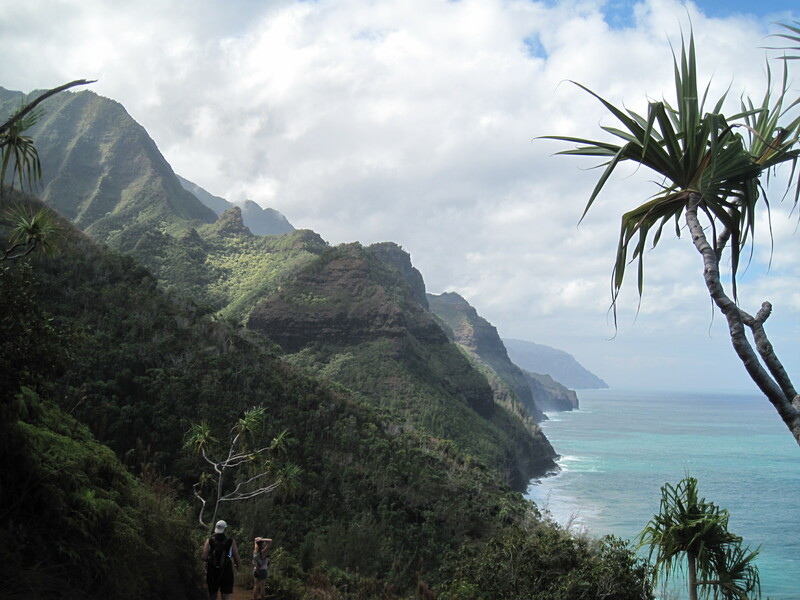 This entry was posted in Hawaii, Self Development and tagged Hiking, Na Pali Coast. Bookmark the permalink. Wow, what an incredible story (and feat). I was totally enthralled reading this – almost like I was there with you guys. Seeing the pictures as you described the different views was fabulous. Jill, I’m so proud of you for not giving up. It’s going to be challenging to beat that story ……………….but maybe not!!! How beautiful!! I can feel a book coming on with your beautiful descriptive words keeping me spell bound until the very end. I even found myself holding my breathe as you went carefully around one section! i wonder what you will call the book “Matt and Jill went up the hill”? Amazing. Loved every word and every photo, what a wonderful story, thanks guys.